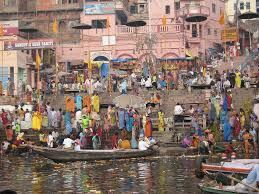 Varanasi is known to be a religious hub in India, attracting hindus and buddhists from all over the world. The city is located on the banks of the ganges, creating a beautiful ambience for visitors to come and worship by the river. When walking on its banks it is common to see hindu devotees bathing in its waters to purify themselves, and to wash away sin. Although the waters are polluted none of its devotees will believe so, It represents lord shiva and is divine. Varanasi is incomparable to any of the cities I’ve experiencedso far, because of its various architecture, population of hindu devotees, and religious influences. Devotees on the banks of the Ganges. My time in Varanasi was pleasant, yet uncomfortable. Taking a boat ride on the foggy river and witnessing the rising sun was an unforgettable experience. The ghats located along the ganges were gorgeous as well, and gave me the sense of how old the city is. Temples could be seen all throughout the ghats that worshipped various deities of the hindu religion. Styles of architecture ranged from northern and southern India. Friendly Hindu devotees from all over India greeted us with enthusiastic hellos, however, many poor children and elderly approached us for hand outs and offerings. This proved to be uncomfortable at times, and it forced me into a position where I had to ignore them as I walked on, facing the guilt of my own conscious. The narrow streets also proved to be a challenge to maneuver. The cars and rickshaws screeched by walkers and road barriers with centimeters of space. I almost got hit at least 10 times, but my past experiences in these bustling indian streets gave me the calmness to push on. Cities like Bangalore, Hyderabad, and Chennai felt more open and modern, as opposed to Varanasis various ancient temples and buildings. The most beautiful site of Varanasi was witnessing the ritual of the brahmin, known as Aarti. They mystified me with an exuberant dance giving thanks to the lord shiva, and the river. The ritual takes place on the Ganges shoreline with Hundreds gathered around to witness. The brahmin priest will perform to the ringing of bells and beating of drums while gently waving lighted candle wicks thats placed on a metal stand. The flame is rotated in a clockwise direction towards the river. It is a ritual that expresses love, and gratitude towards any deity that it focuses on. This ritual is usually performed every evening at seven, but can often times take place throughout the day. I was dazed by the priests ability to perform the maneuvers with such focus and concentration, and could surpass the distractions of the hundreds watching. It was an experience that I will never forget for as long as I live, and it really showed me how much devotion Indians have for the Hindu religion. Various styles of Varanasi architecture. Varanasi is not just home to the hindu faith but the buddhist faith as well. On our journey we stopped at a buddhist hotspot known as Saranath. Saranath contains many important sites thats home to the buddhist faith, and is a place buddha spent most of his rainy seasons in. Deer park is one such site, which is a temple where buddha delivered his first sermon. It contains a giant golden statue of the buddha, depicting all of his characteristics. On the sides of the building contain historical references of the Buddhas life, from when he was born between the twin banyan trees, till he reached enlightenment alone in the forest. These paintings are colorful and bring life to the inside of the temple. The Saranath museum contains preserved sculptures that have been collected throughout the centuries. All sculptures are comprised of buddha and bodhisattva images. The museum contains the best known depicted statue of buddha, as well as the national emblem of India. Lastly we went to the Saranath temple which is embedded with stupas. 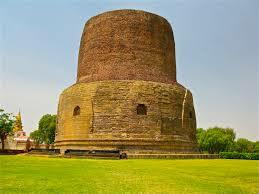 one such stupa is the Dhamek stupa which contains the remains of lord Buddha. This stupa is incredibly tall and wide, elegant for such a righteous man. The Dhamek really resonated with me, because it showed me how much devotion people had for the Buddha, as well as, the impact he had throughout history. This made Varanasi unique, because no other city I visited contained so much buddhist history. I always thought of Varanasi as a hindu city, but buddhism definitely has its influences. 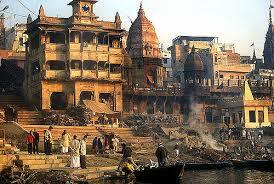 I would recommend Varanasi to any traveler that is wanting to experience the religious and cultural side of India. 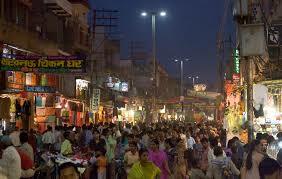 The city gives one the sense of Hindu culture as well as the culture of buddhism. I was uncomfortable at times because of the massive crowds that delve in the city, however, the beauty I saw in its landscapes and people made up for any negatives. The ganges is known to be one of the holiest rivers in the world and I’m blessed I got to experience its greatness. Previous Post: « Sexual Violence in India: The Problem? Culture and Accountability.